The Sistine Chapel is the private chapel of the Pope and is where the majority of Popes in the last five hundred years have been elected. Conclave takes place here. It is located within the Vatican Museums. It is located to the right of St. Peter’s Basilica and is named after the man who paid for it; Pope Sixtus IV. There has always been a private papal chapel at the Vatican, and by the 1400s the previous Cappella Maggiore or Major Chapel was in disrepair. In 1475 Pope Sixtus IV commissioned Giovannino de Dolci and Baccio Pontelli, two Italian architects, to build him a new chapel based on the proportions of the Temple of Solomon as given in the Torah or Old Testament. It would be twice as long as it was high and three times as long as it was wide; approximately 120 feet long, 40 feet wide, 60 feet high. When it was finished six years later in 1481, some of the best Italian painters decorated the inside with scenes from the old and new testaments and these paintings, particularly the later ceiling and altar wall by Michelangelo, are regarded as revolutionary for their time. Once built, the best Florentine painters were called in to paint the chapel. The key painters were Pietro Perugino, Sandro Botticelli, Cosimo Rosselli and Domenico Ghirlandaio. They divided the side walls in to three sections. On the bottom of the walls would be blank squares resembling drapes or curtains. Tapestries were later designed by Raphael to hang over these blank areas in the chapel during conclave, these can be seen in the pinacoteca. At the top of the walls, on either side of the windows would be paintings of the first 32 Popes. There would be 16 paintings, 8 scenes from the life of Moses and 8 scenes from the life of Jesus. 6 remain of each, two removed to make way for the Last Judgement by Michelangelo and a latter two from the back wall removed due to structural damage. The most famous of these is Christ Handing of the Keys to St. Peter by Perugino. At this point the ceiling was painted blue with yellow stars in circular formation, looking like the heavens at night, as was common in churches at the time. After this, no further painting was envisioned. In 1508 a crack appeared in the ceiling, which at that stage was entirely blue with small yellow stars. Pope Julius II asked Bramante to fix the crack, which he did, and Bramante recommended that Michelangelo should repaint the ceiling. The Pope agreed but Michelangelo, primarily a sculptor for the last several years, did not and arguments ensued. The original contract stipulated he has to paint the 12 apostles, but Michelangelo rejected this and went with his own plan, which the Pope approved. In the middle he painted scenes from genesis, with God touching Adam in the very centre. In the four corners he painted the miraculous savings of the Israeli people. In the triangles he painted the ancestors of Jesus and the old testament and pagan prophets around them. The ceiling took him four years to do and is regarded as his best work. The Creation of Adam in the centre of the ceiling is one of the most famous paintings in the world. Hundreds of years of lighting candles inside the chapel had covered the ceiling with a layer of smoke which was cleaned before the millennium, revealing Michelangelo to be a superb colourist. In 1535 the new Pope Paul III asked Michelangelo to go in to the chapel one last time. The Last Judgement or Judgement Day occupies the whole altar wall and shows Jesus sorting out the dead: the elect go to heaven at the top and damned go to hell at the bottom. In the centre souls move up and down in purgatory. Now in his sixties, the Last Judgement took him six years to finish. Two of the original frescos done in 1481/2, a continuation of the motif on the side walls, had to be destroyed to make way for the new painting. It would be Michelangelo’s last major painting work and once again shows his talent for organisation of art. 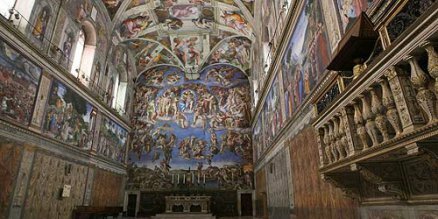 Many people believe that Michelangelo painted the entire Sistine Chapel, a common misconception. He painted the ceiling and the altar wall, which is the huge amount of the available surface, but not the side walls. Michelangelo had trained to paint under Ghirlandaio, one of the painters who had done the side wall scenes, but he preferred sculpture from his teens and saw himself as a sculptor and thought anyone could paint. Da Vinci had the opposite view. Conclave is the election of the Pope, which occurs in the Sistine Chapel. The guides I use explain the process of this, including the infamous black and white smoke, on the tour. The Sistine Chapel is covered in detail on all of the tours I organise. The Sistine Chapel is located within the Vatican Museums, you cannot go directly in to the Sistine Chapel by itself and have not been able to so since the year 2000 when the museums became compulsory and mono-directional. If you would like to see the Chapel as soon as possible, I recommend taking a tour in the morning, as in the afternoons the short cut route of the museums is closed and two hours of museums are necessary before the Chapel can be viewed. In the morning time only one hour of museums is necessary before the Chapel can be viewed. The pictures above are authorised photos of the Sistine Chapel, no one is permitted to take photos of or film inside the chapel under any circumstances. Thoroughly pleased with the entire experience.